Every now and then the cycling gods frown upon us. The plan was to meet Scott (a New Zealander traveling across Europe) in Morzine. 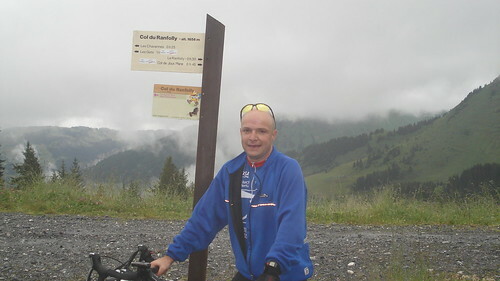 It was rainy, and Morzine is at about 1000 metres so it was pretty cold. Traffic made me a bit late and when I pulled up – there was Scott examining his bike with a very fat lip – he had just been hit by a car. Luckily nothing too bad – although we needed a bike shop to fix his wheel. Learning from last week, I had full winter gear on (thermal jacket and gloves) and I lent Scott a jacket but he declined some long cycling pants. 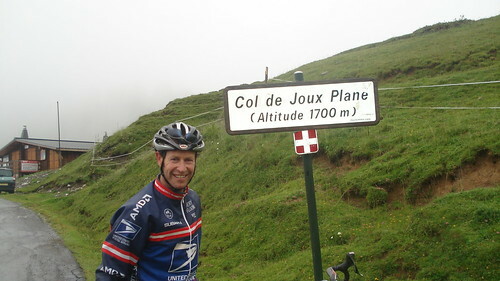 We decided to climb Col de Joux Plane – from the easier side (link to climb details). We quickly warmed up – though I really sucked air chatting with my much stronger partner. After passing Col du Ranfolly, we reached Col de Joux Plane and due to the cold started descending right away. 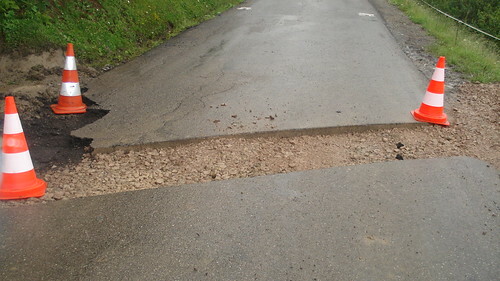 Suddenly Scott slowed down and warned me to stop, but on the wet road I couldn’t brake in time as I saw a huge ditch in the road. No choice I tried to jump it – but my back wheel hit hard and it burst – luckily I didn’t fall. We tried to change it quickly but when blowing it up with a CO2 cartridge the air chamber AND the tire itself exploded – in the cold we hadn’t noticed that the wheel rim had been damaged. No choice. I handed my car key to Scott and hoped he was a faster descender than me (he is). 45 minutes later he “rescued” a shivering me. Oh well, it could have been worse. At least the Pizza for lunch was excellent.